Audrey, Katy and Adam have been friends since high school-a decade of sneaky cigarettes, drunken misadventures on Melbourne backstreets, heart-to-hearts, in-jokes. But now Katy has gone. And without her, Audrey is thrown off balance: everything she thought she knew, everything she believed was true, is bent out of shape. Audrey’s family-her neurotic mother, her wayward teenage brother, her uptight suburban sister-are likely to fall apart. Her boyfriend, Nick, tries to hold their relationship together. And Audrey, caught in the middle, needs to find a reason to keep going when everything around her suddenly seems wrong. Evocative and exquisitely written, Our Magic Hour is a story of love, loss and discovery. Jennifer Down’s remarkable debut novel captures that moment when being young and invincible gives way to being open and vulnerable, when one terrible act changes a life forever. 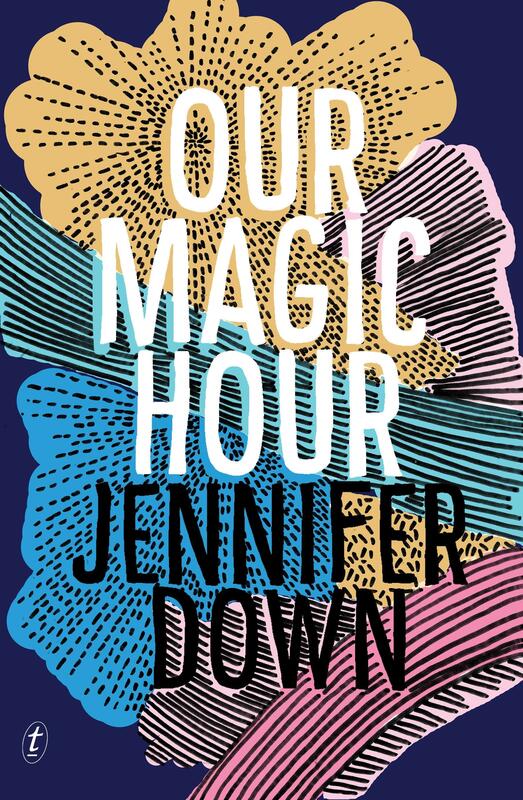 Jennifer Down’s Our Magic Hour is a brilliant Australian debut. Intimate, raw and occasionally heartbreaking, this is a book that demands to be devoured quickly, but stayed with me long after I finished the final page. The story develops out of a triangular relationship between three childhood friends now in their mid-twenties – Audrey, Katy and Adam – and grows in scope to include Audrey’s relationships with her boyfriend, Nick, and her family. Tragedy strikes within the first handful of pages; the novel traces the ripple effect of grief after such a climactic opening. Our Magic Hour holds a mirror up to real life; plot, in a traditional sense, takes a back seat, allowing Down to explore the complexity of these relationships with empathy and nuance, never shying away from her characters’ ugliness or shortcomings. The power of Our Magic Hour largely stems from Down’s skill in exploring the myriad ways that grief, trauma and mental illness manifest themselves in spaces and gestures between people. No person or incident in the novel reads as particularly out of the ordinary; the events that occur, both the devastating and the everyday, will strike a familiar chord with many readers, and the characters jump straight off the page and onto the 86 tram down Ruckers Hill, or the bus to Coogee from Central station. Place is integral to plot here. Melbourne and Sydney read almost as characters in their own right, strengthening the recognisable, Australian voice of the novel. I loved this book. Down is an exceptional writer who displays real control over language while still daring to experiment throughout with dialogue, tense and form. I’m sure that this novel will launch her career as a major new literary talent. Our Magic Hour is beautiful, gut-wrenching fiction and I cannot recommend it highly enough. Stella Charls is marketing and events coordinator for Readings.